work. I love running Games Done Legit, but I don’t always love running a business. But when I think of running a business like I do achieving in videogames, it makes a little more sense to me. 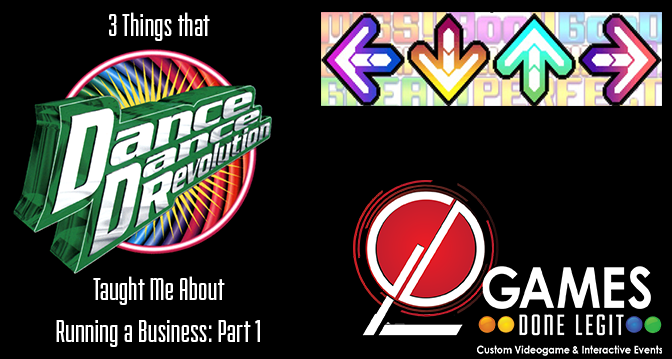 With that, I realized 3 things Dance Dance Revolution taught me about running a business! Editor’s Note: At Games Done Legit, we don’t blog to get clicks. We love writing, entrepreneurship, videogames, & virtual reality, so we want to tell you a story that will help you in business but you’ll also actually want to read! Leave this open in your browser so you don’t try to blaze through it all at once! Enjoy it! For the uninititated, DDR came out in arcades in 1998, and quickly became the biggest craze at the arcade since Mortal Kombat. Basically, instead of a traditional joystick and buttons, the game plays crazy Japanese music while the player follows on-screen directions that tell you how to “dance” on a four-arrow pattern on the “stage”. 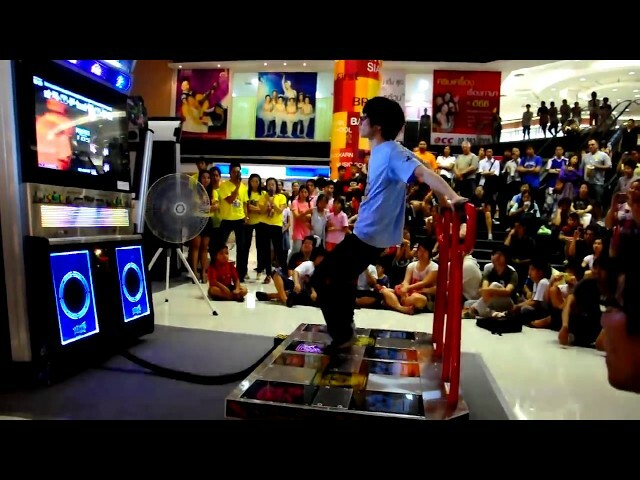 [youtube]https://www.youtube.com/watch?v=T0cxJc3ESjI[/youtube] Calling DDR a workout at high-level play is the ultimate understatement. As you can see (this was the last DDR tournament I competed in), playing won’t help you with actual dancing unless you plan to go all Riverdance at every social event the rest of your life (be it ho-down, winter formal or couple’s first dance). 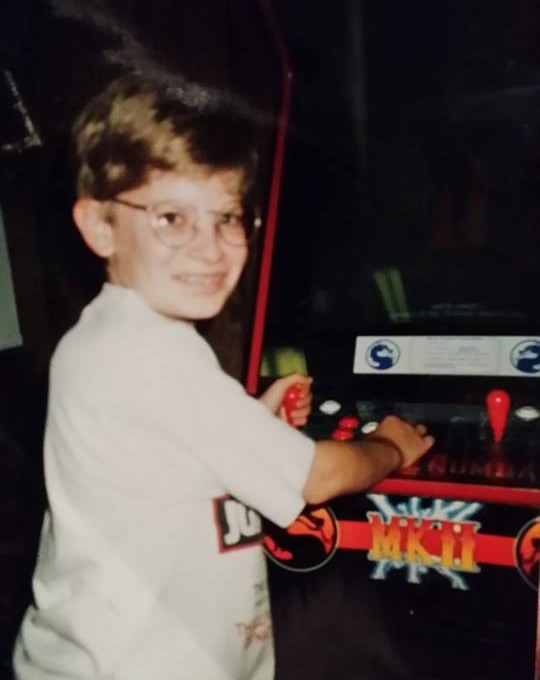 It did, however, provide us arcade-goers and home-pad players with: bizarre music permanently etched into our brains; a great workout; a way to bond with others over shared weirdness; and the confidence to look like a goofball in public and not care. The popularity of DDR and game creator Konami’s fleet of fake-musical-instrument arcade games generated millions of dollars and yen. It also provided a literal template for Guitar Hero and Rock Band to take America and Europe by storm a few years later. [youtube]https://www.youtube.com/watch?v=4JTV0ZTk_XM[/youtube] Look familiar? 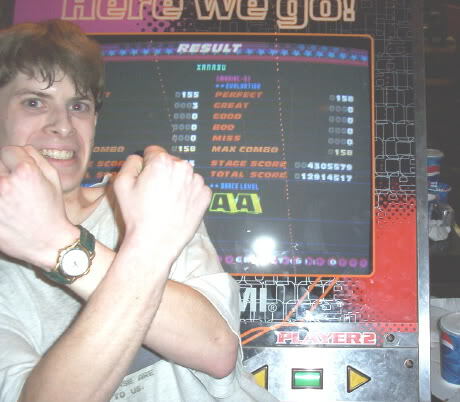 Team Xanadu for life I played DDR casually for 3 years upon discovering it as a freshman at Ohio State in 2000. “Casually” in gaming usually means doing something “just for fun” — meaning you don’t care about entering in tournaments or getting better in a serious, measured, planned way. However, most people enjoy videogames casually — trying to get better or farther in the game, but not in a way that is like “work”: studying, analyzing, practicing, with some higher goal in mind (e.g. getting paid for your skills). 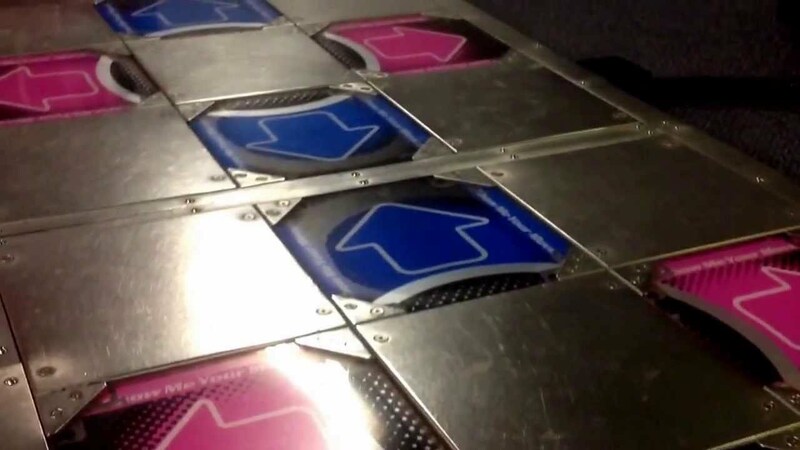 [youtube]https://www.youtube.com/watch?v=oiC28ND2iz4[/youtube] Socks instead of shoes, Light mode, feel going back to the middle, random hopping: this is as good as 99% of DDR players get. And as long as you’re having fun, that is totally fine and awesome! For whatever reason, videogames have always been the arena that unleashes my drive to achieve. You’ll won’t find bigger smiles on me as a kid than after wrecking house at the arcade. So when I came home for summer and met people who took DDR really seriously, I was hooked. Not only had I discovered an enthusiastic, friendly new group, and a new game to compete in that was also exercise, we had some of the best players in the world right there in Cleveland. By watching and learning from the best, we could see what was possible to achieve. Many of us wanted to follow their lead and achieve the highest scores the game could grade you on. [youtube]https://www.youtube.com/watch?v=wCNHMaDYdGw[/youtube] This is Kevin Boddy from Cleveland-area and one of the best players in the world — for awhile, probably THE best — achieving something insane almost no competitive player can even come close to doing Now, we had a measurable goal for every song we played, and we had people to show us how to achieve it. Think of being in school. If you just cared about passing versus setting a goal to get an A. 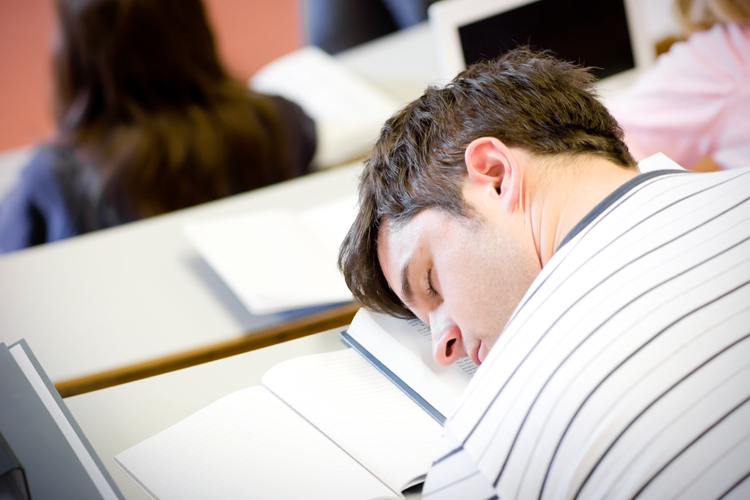 Usually, paying attention in class, studying and doing your homework are the steps you take to get A’s. It’s possible he’s so far ahead of the class he’s just bored, I suppose, but unlikely! Well, in DDR, it’s AAs and AAAs you’re after. Now this is super dorky stuff, but for us competitors, we were into DDR as professionally as you can do anything without getting paid for it (and we were in fact paying 50 cents a game!). 1. Homemade spreadsheets to track our scores. (Which evolved into fans making their own Internet-based score trackers. This was before smartphones mind you. Glad mine is still up!) 2. Incorporate Outside learning via a DDR simulator on PC to practice song rhythms & patterns with our fingers. 3. Comparing our scores to other players. 4. And finally, repetition, or what author Chet Holmes calls “pigheaded discipline and determination“: playing the actual song over and over and over — for days, weeks, months — until we got our desired score. Before Games Done Legit, before Season’s Beatings Tournament Series, there was FNScrew, the DDR team we created for no reason in particular for the top Fun ‘n’ Stuff players. And I founded Team Xanadu, the only thing approaching a real team Ohio ever saw (but still completely silly). It coincidentally took me three years of running Games Done Legit to figure out how to take GDL from being a job I created for myself to a business — just like after three years I discovered competitive DDR. The first key is to set a goal, any goal. If you’re just thinking about starting a brand, find a checklist of the things you need to do to start a business, and do one per week. If it’s increase sales, set a number of extra client calls a week. 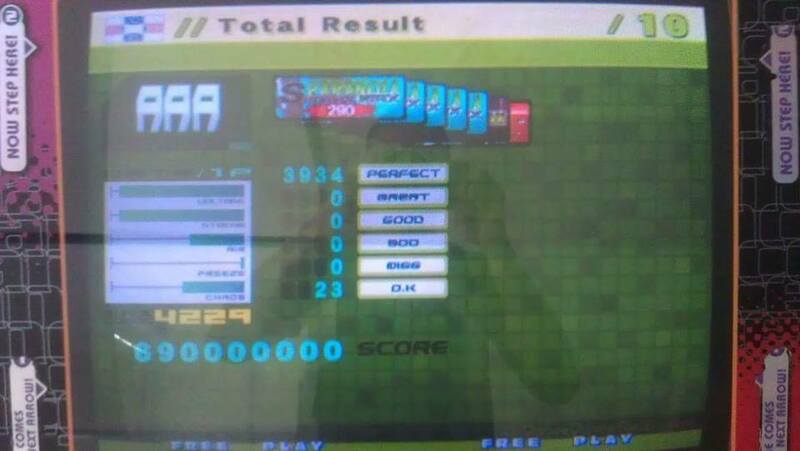 In DDR, in 2005 I worked up the confidence that I could get my first AAA, although that sounded impossible. How could I play perfectly for one minute, 40 seconds on even an easy “heavy” song? I hate tracking financials and goals. So I got a business coach and a CFO who can help me do it for GDL. Now our sales process and marketing are driven by our goals. I finally realized that not tracking a goal means I’ll never achieve it, just like in DDR. If you don’t count your perfects it’s literally impossible for you to become better at the game. Books, mentors, blog posts, podcasts, networking groups: There’s a ridiculous amount of free and low-cost resources out there to help you. The DDR sim on PC we used was free, and we could tweak the timing to make it really tough. 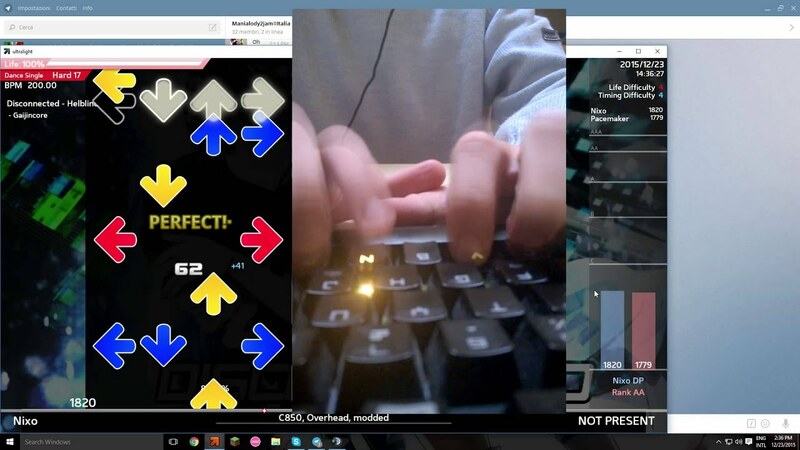 By making the timing way more harder to get perfects with our fingers, we drilled into our head what “marvelous” timing was, and that made playing songs on a real machine with our feet much easier. I don’t mean in an A-type, “I must be better than you!” way. I do mean, look at who’s doing great things and learn from them. Talk to them, email them, whatever. Most people enjoying sharing their story and feeling like a valued expert, whether it’s in business or as a videogame player. 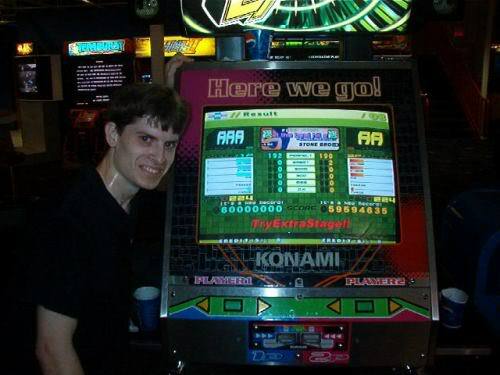 I know this pic is Pump It Up, not DDR, but it was the best tournament pic I could find! Send me a better one for DDR! This is your X factor in life. When you’re confident in your goal and the way to get it, try, over and over and over. Videogames teach you that if you never fail, you’ll never get better. To add on to a Solid Snake quote, “Never doubt yourself [because of failure]. Just let it make you stronger. Learn something from it.” I’ve accomplished feats in videogaming I never imagined because I had a burning desire to achieve them, for whatever reason.